It goes without saying that a wedding day is like a dream day in any woman’s life. And it is important to make that woman feel beautiful with the most expensive as well as expressive forms of jewellery. Indian Bridal Jewelleries grab everyone’s eyes due to a fantastic visual appeal of their nature. Craftsmen put in their best effort to handcraft these jewelleries giving the wearer a sense of pride. However, the actual value and beauty of this jewellery lie completely on the person who is wearing them. A bride remains incomplete unless and until she adorns herself with exquisite touch of this jewellery. Bridal jewellery is important and makes a bride look special outshining the huge crowd. This jewellery not only makes her look amazing but also helps to take her beauty to a different level. Maharashtrian bridal jewellery is the most exquisite form of jewellery and they look simply gorgeous when worn by a bride. Apart from the Paithanis, what sets apart are the traditional ornaments on a Maharashtrian bride. Here are some of the most essential types of jewellery which are best for Maharashtrian weddings. Both the bride and groom wear mundavalya. They are basically pearls tied on a string which both wear on their foreheads. These jewelleries are important for the wedding rituals and the bride’s face is shaped beautifully with the pearls. The mundavalya is tied when the bride walks the mandap, which is a classic ritual telling that the bride is willing to get married. Worn at times of wedding or even at puja ceremonies, these are small rings for the nose. They can come in various shapes and patterns and usually contains pearls or white stones around them. However, nowadays women even wear nath with indo-western dresses, giving a chic and stylish look. This is essential armlet brides wear during their wedding. They ideally wear on one arm and adds a finishing touch to the overall beauty of the bride. However, vaaki are available in a plethora of designs and trends. Women tend to fall for the ones which are in gold. Vaakis contain a ruby which depicts the sun and the red colour is sacred for the Hindu bride accordingly to the Hindu mythology. As the name suggests, these ornaments come from Kolhapur region of Maharashtra and are gifted by the grooms’ family to the bride. These Saaz are as important as mangalsutras. This Saaz comes in different styles, ranging from leafy patterns or rounded ones with studded stones on them. These thushi looks like a statement neckpiece and are beautifully craved for a women’s wedding day. The gold seeds embedded in them indicates the bride will be happy in her new home and bring happiness along with her. Jewellery is the best friend of a bride and it is always necessary to make her look happy. So, don’t wait much! 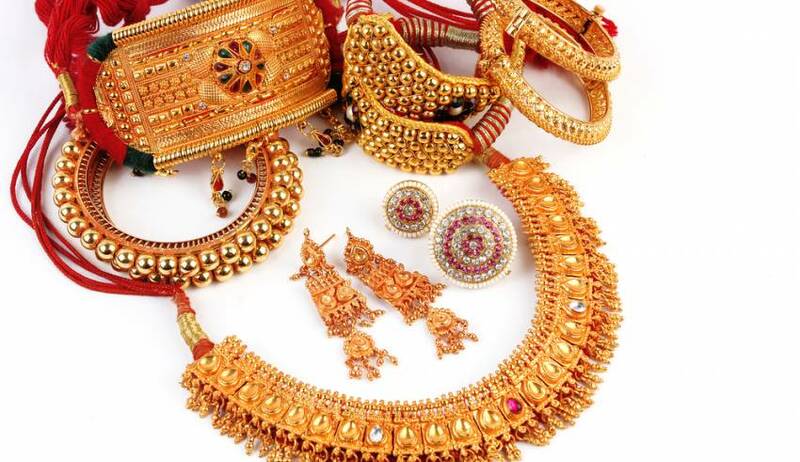 Grab these Maharashtrian jewellery sets which can make any bride go from oh to wow!